Mark Powers turned 56 in May of 2018. He has struggled with alcoholism for most of his adult life. 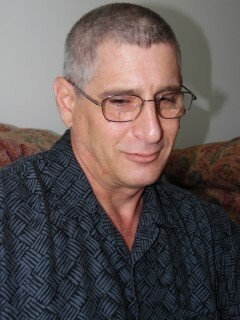 Just after the age of 50 Mark accepted the fight for his life, sobriety. Through much pain and struggle he has been sober from alcohol for five years. Mark wants everyone to know “there is hope”! His remarkable story also involves being homeless for five years. His journey while homeless lasted for five years, walking the streets of six cities, and experiences he will never forget in seven shelters. 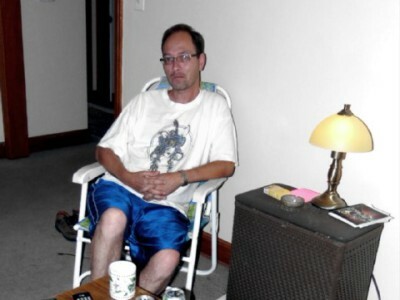 For 30 years Mark drank his money and life away. His paychecks would be drank away within days. The amount of booze he drank left little if anything for food, rent and bus fare to go to work. He pushed through holding down jobs knowing he needed the money to feed his addiction. The low point was reached when he said “It just got old”. He was living to drink, and drinking to live. The main thing, he said “I was always broke”. He was feeding a monster that kept taking more of more of who he was leaving nothing in life enjoyable. His life took a drastic change for the better on Dec, 13, 2013, he become involved at Westbrook Health Services of Parkersburg, WV. 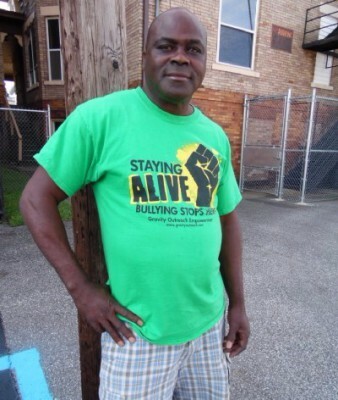 At that time he started participating in counseling, housing program, then Peer Support. Sadly in 2018 the program closed and Mark was the last person in the peer support program to leave. He was apprehensive about leaving because he feared without the support he would go back to drinking. The thought of going out in the community alone was unnerving. One final referral made by the Peer Support program was for him to meet with Roberta Shoaff, Southwestern CAC, INC’s SSVF Service Coordinator, in downtown Parkersburg, WV. They felt Mark was ready to make the move into permanent stable housing on his own. 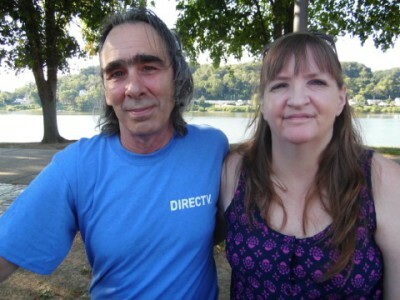 Mark met with Roberta and was immediately enrolled in the SSVF Rapid Re-Housing program. Through intensive individualized case management Roberta and Mark were able to draft reasonable goals. The case management aspect of SSVF was invaluable for Mark. Roberta was not just his case manager, she became one of the few people he considered a trusted friend. Roberta recognized immediately the importance of connecting Mark up with a wide variety of supportive agencies. Mark was not a client that needed light touch rent and a handshake to send him on his way. His long-term stability would rely on continued mental health, DHHR and SNAP benefits, integration in AA, and budgeting. Marks fears never materialized. He has forged a new beginning with the help of SSVF. He is in his longest stretch in terms of sobriety, employment and housing. 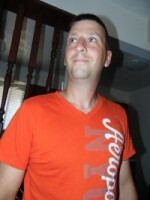 Mark started working for Little Caesars Pizza while he was still at Peer Support. Due to his likable personality the pizza chain hired him to be the face of the store. 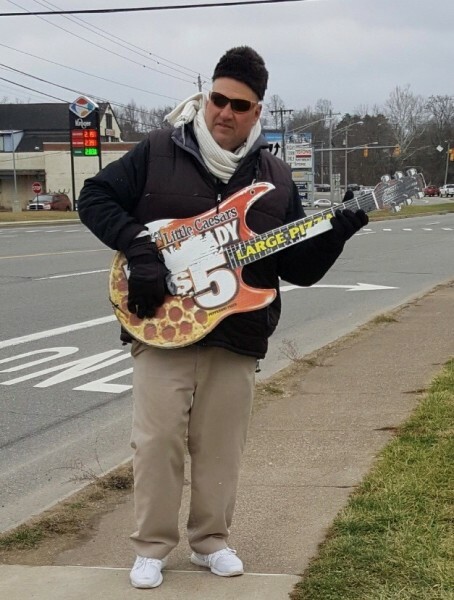 Marks duty is to stand on Division Street, waving and playing his guitar representing Little Caesars. He has been in this positon for a couple years. When asked what he thinks of his job he loudly said “I LOVE IT”. The company has offered him several other career options that he quickly declines. He tells them he would not trade his job for anything in the world. Mark is now a Parkersburg icon. The community knows him as the man on Division Street waving and playing his guitar. Rain or snow he is there 4-5 days a week. They know him as the smiling face waving to traffic. They do not know his story of struggling with sobriety and homelessness. Mark is a proud Navy Veteran of 4 years. Mark is an avid WVU fan and loves his Mountaineers. He now has the confidence necessary to tackle each day and attributes his success to the many individuals and groups that extended help during his journey. Especially SSVF and his friend Roberta Shoaff. Side Note: Upon talking with Mark about submitting this success story, he stopped our conversation and quickly turned toward the main road. He said, “Oh it’s a funeral” and took off his hat, held it to his chest and bowed his head. He stayed in that position until the funeral procession passed. After showing his respects he was ready to continue our conversation. Mark is the kind of guy any of us would be lucky to call a friend and neighbor. When one thinks of the word success, most think of money and/or monetary things. The word Success truly has the simple meaning of the accomplishment of an aim or purpose. I knew there would be difficulties to face when legally separating from my children's father, but I had no idea the full extent of what strength I would need to truly survive the eventual divorce and make a life here for my girl's that was better than what I endured as a child. Long story short- I had no family support and found myself homeless. I was attempting to fall back on the only resource that I knew available to me at the time which was my GI Bill. I soon learned about all the organizations that could aid me. 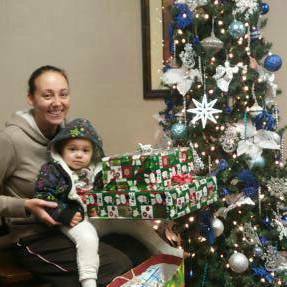 Thomas Ramey and the Southwestern Community Action Council, Inc. (SCAC) office were extremely helpful and really went out of their way to see smiles on my little girls faces. I have tears in my eyes typing this letter and I can't express in words my gratitude. Providing me with financial assistance for rent and utilities really took a huge weight off my shoulders. Helping also with providing food, dishes, utensils, cleaning supplies, and even beds, was so much more than I could ever expect. As Christmas was creeping around the corner, the office surprised my kids with gifts. To see the pure joy on their faces was beyond heartwarming. The individuals at the SWCAC office truly cared about me and my kids and that means so much when you know that your own family doesn't. This gave me a sense of encouragement and determination to keep pushing forward. I was able to get assistance through referrals to have my girls in a great day care facility with Marshall University while I attended classes full time. Unfortunately, I quickly learned how difficult the divorce would be as I was faced with severe depression and guilt for running away from an abusive relationship. I realized I was also going to need intensive therapy for my mind. It was very difficult for me to accept that I needed help. I had to get my mind right before I could align everything else to achieve my ultimate goal of providing a wholesome life for my children. I realized what's most important in life, my kids! Once I was refocused, I started climbing! I decided school would have to be put on hold and I would have to start working in order to pay the bills. I started working with the Workforce WV Disabled Veteran Outreach Program Specialist (DVOPS) to help me overcome barriers to employment. I was able to gain full time employment making minimum wage. That wasn't good enough for me. I set my sights on a position working for Workforce Investment Board as a front desk receptionist. I was able to get professional attire, job couching and a special kind of encouragement through Dress for Success. That position enabled me to network with numerous people and show my potential. I was able to apply and obtain a DVOPS position with Workforce WV. I now help Veterans from a unique perspective. The resources available to me, and the drive and determination within, allowed me to succeed. 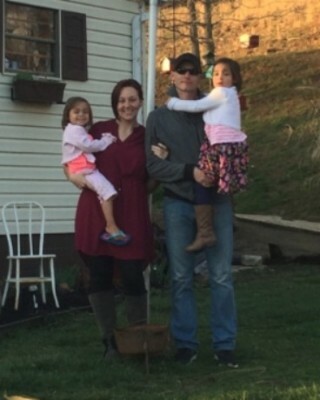 I have been able to buy myself and my girls our Forever Home. I have secured permanent employment with benefits and have been afforded the opportunity to be a board member of DFS. Homeless Veterans Resource Center, SWCAC, SSVF, Dress for Success, VAMC Huntington, and Workforce WV, have all helped me to accomplish my ultimate goal of providing my children with a happy and healthy childhood. achieved any amount of success without help. I am now able to give back to others who also need it. "I think it is a disgrace in the USA to have two words together - homeless and veterans, said 59-year-old Huntington resident Frank Akers. Akers found himself homeless when the building in which he had resided was condemned by the health department due to black mold. "I had nothing to start over to get housing. Sure I was struggling before, but I was housed. My world took a devastating turn overnight." he said. "Never in my wildest dreams did I think I would be homeless. I had always worked and taken care of myself. It was difficult finding myself sleeping on the porches of condemned houses. When you have no place to turn on the electric or flush the commode, you realize what rock bottom feels like." Akers, a gay man and Navy veteran, said his life has been riddled with humbling experiences, being an earlier military veteran when being gay was considered a mental illness and was illegal. "But being homeless and no place to go was the most humbling," he said. Akers said SSVF provided a rapid response to get him housing. "Sometimes it requires some humility to ask for help," he concluded. The Supportive Services for Veteran’s Families (SSVF) program in Huntington, which also serves several West Virginia counties, is designed to lift very low-income veteran families out of homelessness and into stable permanent housing. Through this program Southwestern Community Action and their SSVF program provides comprehensive assistance in the areas of case management, outreach, temporary financial assistance, and referrals to help in obtaining VA benefits. Shawn Ashworth is a US Marine veteran from Huntington who found he and his children, with which he has custody, homeless for the first time. "I feel like I'm on the upswing in life, with a roof over our heads," said Ashworth, having had the housing provided by SSVF for about four months. He said he found himself and family sleeping in old cars. Ashworth said he had suffered bouts of depression, having family problems, a custody battle and losing his job. He has recently obtained new employment. 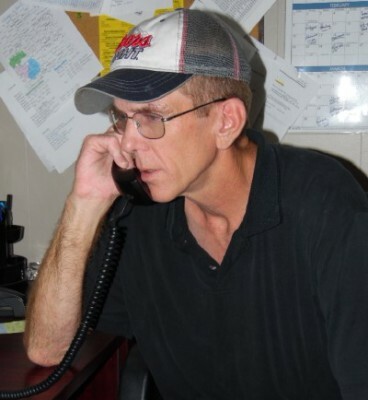 Ashworth called Thomas Ramey, SSVF coordinator, "A miracle worker." The Supportive Services for Veteran’s Families [SSVF] program in Huntington, which also serves several West Virginia counties, is designed to lift very low-income veteran families out of homelessness and into stable permanent housing. "I think most people have a stereotype of the homeless," said 28-year-old Aaron Blankenship, a three-year veteran of the US Army. "Many Americans are a paycheck from being homeless, or after facing unforeseen circumstances," he said. 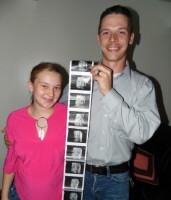 Blankenship (left) and his young pregnant wife got "tossed out" of a family owned dwelling, both were students at Southern Community College at the time. 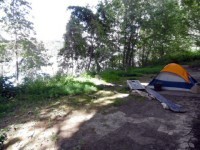 They found themselves sleeping in a tent off the beaten path near Huntington. "It was a trying time for us, my wife pregnant, working wherever I could, and worrying where we would get our next meal," Blankenship said. Speaking of Supportive Services for Veterans Families (SSVF), he said "They saved my life," after he and his wife had been living in a tent near Huntington, both now enrolled at Marshall University. Blankenship is also working on getting an Underwriters License, and is now working at a new job. "The agencies outreach worker Thomas Ramey was a savior, bringing blessed relief," he said. 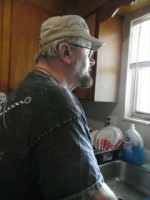 Blankenship has been with SSVF for 90 days, and he and his wife are rebuilding their life in a well-kept apartment. "We are picking up the pieces and finally beginning the process of putting our lives back together," he concluded. Many homeless veterans sleep in tents, cars and vacant buildings. The Supportive Services for Veteran’s Families (SSVF) program in Huntington, which also serves several West Virginia counties, is designed to lift very low-income veteran families out of homelessness and into stable permanent housing. Couple display photos of baby soon to be delivered. Fifty-two-year-old Robert Conover of Huntington was a general contractor for 25 years, and found himself in crisis after the death of his wife, he was admitted to a crisis unit. A veteran of the US Army, Conover said he has 11 brothers who have served in the military. "I never expected to find myself homeless, but I always told myself it was temporary, and with some help I'd pull myself out of this," he said. Conover said he lived on the river (Ohio River), the stereotypical "under the bridge" homeless. "I still have a couple friends who are there," he said. 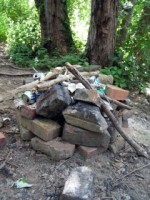 A homeless "cooking stove" along the Ohio River Conover said "I know the life of having no home"
"A lot of veterans have serious mental health problems and many of them are too proud to ask for help." Conover, who is a recovering addict, said Supportive Services for Veterans Families (SSVF) "Threw me a rope when I was in a 10 foot hole." "A number of agencies have helped. I'm still living at the City Mission while I work on my new place," he said, doing extensive remodeling to his newly acquired home. "When you're down and out, some agencies put you on a list, but SSVF was a beacon that took action quickly," he said. 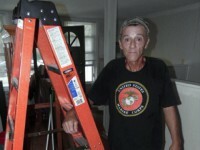 Fifty-three-year-old Timothy Costen, a long serving US Army veteran, found himself homeless when his longtime residence at the Prichard Hotel was condemned and closed. Fifty residents of the building were permanently displaced. Costen, who suffers from Post-Traumatic Stress Disorder and is disabled, was homeless for two months, sleeping wherever he could. "I got put on housing lists, and had little money to start over," he said. "Finding a new place, coming up with the deposit money, would have been impossible without the helping hand of SSVF. I'm settled again, they took care of the small details that are overwhelming to me, a small investment achieving a lot." 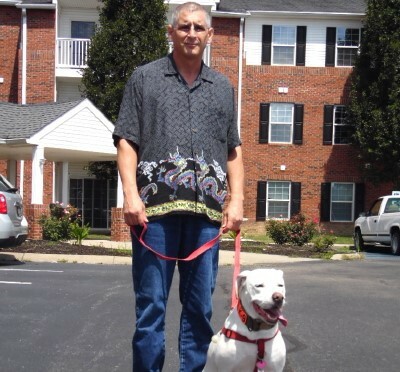 Costen (left) lives with his service dog "Sukie," which helps relieve his stress disorder. "It was a very trying time, I could feel myself sliding down a dark tube," he said, now comforted that he has a roof over his head. "It happened quickly, my wife of nine years died in her house in 2010, and her family moved in and threw me out," said Paul "Cowboy" France. Seventy-year-old France, a US Army Veteran and recovering alcoholic of 15 years, said those who kicked him out continue to have significant drug problems. "I've slept in cars, tents and old buildings, until Southwestern helped me find a place and then bought me a mattress," he said. "I was at the bottom of the barrel. It was a wonderful thing to put my head on a pillow." 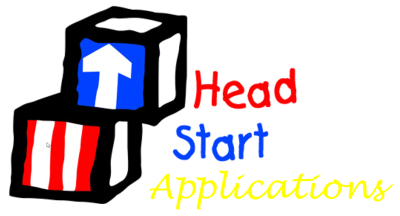 The agency often provides the initial rent, deposits, groceries, kitchen items and a bed, and networks with other agencies to provide services and find employment. France said, "Most people take it for granted when they have a bed and pillow to sleep on"
"I felt worthless as a homeless person," he said, "but I held on to a hope for life," said France, who worked 25 years as a truck driver. France, who suffers from arthritis and diabetes, relied on local food pantries and "soup kitchens" while surviving one-day-at-a-time. He is currently assisting in keeping clean the complex in which he lives. He came from a family of ten, saying his own children are now struggling with many problems. "I now have a place I can call home," France concluded. "There are people who care about homeless veterans," said 53-year-old David Hall of Huntington, who said health problems put him deep in debt, causing him to become homeless. Hall, who has been sober from alcohol for 12 years, is a six year Navy veteran with four years in the reserves. "I found myself sleeping in my car, after getting eviction and termination notices, and no where to turn," he said. "SSVF saved me. I thought I was going to have to stay at the homeless mission where I had once been a maintenance worker," he said. 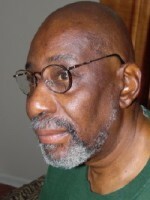 Hall worked in heating and air conditioning most of his life, until his health failed. "I never wanted to use any system, just make it, but I found myself with my last straw," Hall said. 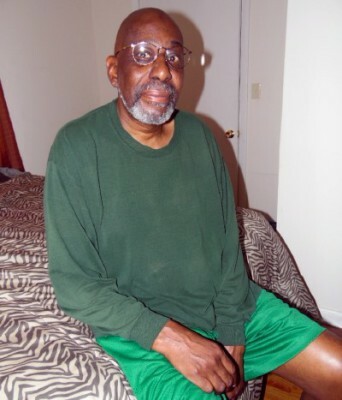 Cab driver and US Army veteran Kenneth Lloyd Jr. found himself homeless in Huntington. "I got behind in my bills," saying it happened so quickly, sleeping in old buildings or wherever he could. "I never ever imagined that I would find myself that way." He lauded SSVF, whose mission is to quickly find housing for homeless veterans. Lloyd was quickly placed in a housing unit, with a roof over his head. Veteran Moses Blount, 56, spoke about his troubled life with drugs, addicted to crack cocaine and alcohol. Having gone to prison, he was released on parole in Huntington, and found himself homeless, at times living in at the Mission. "When I went to housing agencies, I got put on a list, but SSVF got me a place and a mattress real quick," said Blount. "I never thought I'd end up homeless and hit the bottoms I have." Blount said he had made many mistakes, burdened by many problems, but life is better now. Thirty-four-year old homeless vet John Napier said, "Under no circumstance did I ever dream of finding myself in this spot." The 12 year Army veteran, who served in Iraq and Afghanistan, said he was evicted from a house owned by family members following a dispute. "I've seen things change quickly in the military, but this homeless thing happened so quick," Napier said. "I've traveled the world to see terrible poverty, and here I find myself." He described a longtime negative relationship with his father, the reason why he joined the military. Napier described a number of physically abusive events, in addition to long time emotional abuse. "As a child I lived with constant abuse." Napier now has three children, age three, six and seven. He said he slept in parks and woods, having worked as an EMT, in janitorial services and in construction work. "Having a roof over my head with the help of SSVF has been a godsend," he said, looking for the delivery of a mattress provided by the agency. 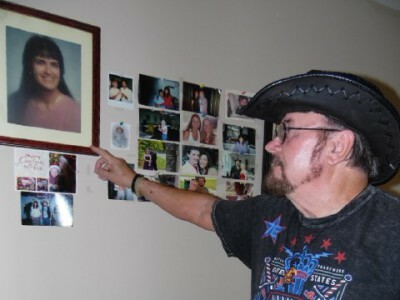 Dave and Terry Osofsky, married 34 years, found themselves homeless in Huntington following a series of tragic events, Dave a 13 year Army vet and Terry served four years in the military. "It has been quite a journey," said Osofsky, who has worked in the computer technical field, saying their life began really falling apart when they lost their 28-year-old son in a 2011 motorbike accident. "We lived in our car with a son and a dog along the (Ohio) river. Nearby many homeless sleep under the bridge in tents," he said. "My wife had a serious mental breakdown, the walls of the car closing in, and she sought help, and got it, at the Huntington VA hospital." "It was a blessing she went into the hospital. Without the help of SSVF, it would have been a hard row." 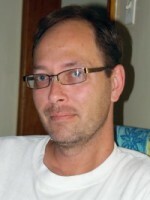 ​Outreach Coordinator Thomas Ramey said, "The Osofsky family is one of the SSVF success stories. Their biggest problem was overcoming the financial hurdle of deposits. Once they were housed, Dave was able to find a job. This program has helped them to regain control of their own lives, and the ability to map out a happy future." Carla Ferguson, Director of Lincoln Unity Apartments in West Hamlin, said "Helping veterans, and providing housing through SSVF is a way I can feel good about my job." "We can make a difference in their lives," she said. 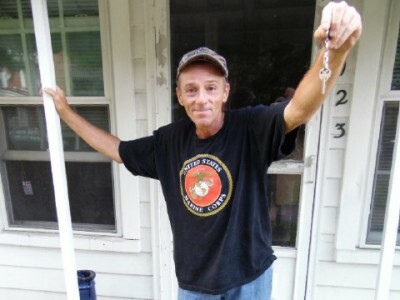 Ferguson provided housing for long-time Navy veteran Steven Pelfrey, 62, who also served in the Marines for three years. Pelfrey, a truck driver and baker, said following a conflict with his daughter, he found himself living under a bridge. "Although I had an income, I had no money saved and couldn't come up with the deposits," he said. Pelfrey says he spends part of his day helping around the housing development. Ferguson said housing agencies help keep money in communities. "We are grateful to have a working relationship with SSVF," she concluded. Sixty-year-old Huntington native and Air Force veteran Rodney Miller says he was only two paychecks from being homeless. And the circumstances turned from hypothetical to realty overnight. "Losing my job in customer service was a killer," he said, becoming homeless for the first time, and suffering from serious medical problems. Miller was quickly found an apartment by SSVF, who acquired a bed for him, emergency groceries, kitchen essentials, and job placement referrals. "The program got me back on my feet. I’m working, but looking for other opportunities every single day," Miller said. "I wish SSVF could buy furniture. 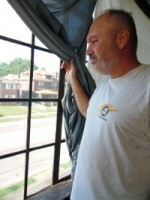 But with their help and referrals, I know we will find furnishings for my apartment." Veteran Ernest Wingerd, 53, said he has had a troubled life, saying "I'm the kind of guy who just doesn't fit in anywhere." Having served a prison sentence, "I've been a construction worker for years, and have really tried to make it," saying he has been disconnected from his family for years. "I still want to go home," near Martinsburg WV. He served in the US Navy for five years. 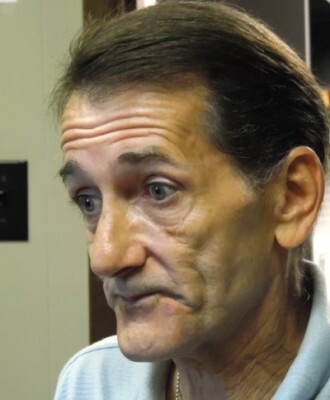 Wingerd says he is use to a lonely life, now living close to community services "I know what it's like to be homeless and hopeless," he said, "but I've always trusted God that a path will be found," saying he has been sober and clean for 8 years. "I've slept in cars, dumpsters, abandoned houses and in the woods," he said. "I was told about SSVF, and they helped me find a place and a mattress," he said. West Virginia counties, is designed to life very low-income veteran families out of homelessness and into stable permanent housing. 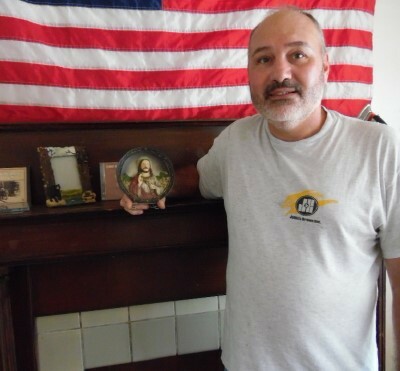 Former homeless vet sas, "It's a humbling thing to need a bed, and now have one"
42-year-old Keith Wood, a US Army veteran, was recently rapidly re-housed by SSVF at Southwestern after sleeping in a car for three months, not his first homeless experience. Wood has multiple health problems, from PTSD to a heart condition and emphysema, and is under constant medical supervision. "My family knows problems well, my mother put me out of the house when I was 12, because of the man she was living with," Wood said. "I learned homelessness early." He has been recovering from alcoholism for three years. Wood said because of his disabilities, he has had a difficult time making a living. "This last time homeless, I was at my wits end, no where to go, no where to turn. I was giving up, when someone told me about the SSVF program." The Supportive Services for Veteran’s Families [SSVF] program in Huntington, which also serves several West Virginia counties, is designed to lift very low-income veteran families out of homelessness and into stable permanent housing. Through this program Southwestern Community Action and their SSVF program provides comprehensive assistance in the areas of case management, outreach, temporary financial assistance, and referrals to help in obtaining VA benefits.